To date we have been driving around in a large rental car, thanks to our 4 times upgrade from Avis. Minor electrical faults meant we had to trade it. 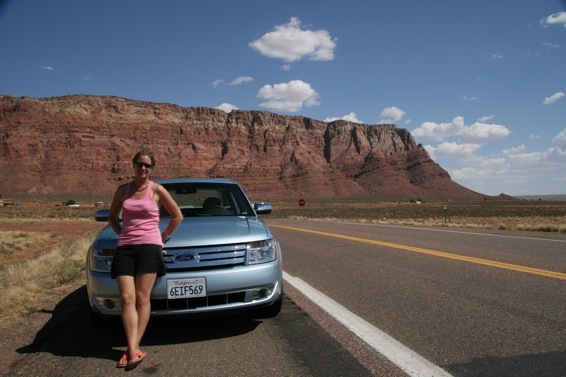 We really got lucky – we had our choice of all the cars at Vegas airport, and ended up with an even bigger car, a Ford Taurus. In American terms it is still “Midsize” but it it is a giant – it can fit our backpacks, camping gear, large duffel, guitar and extraneous stuff in the boot! We left Vegas in new silvery blue style, all set up with our synced Ipod and GPS. 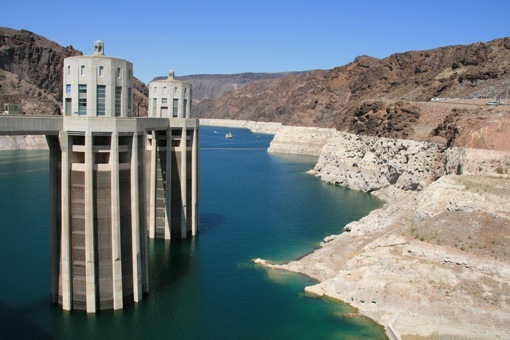 Hoover Dam was the first stop, a 1930s manmade wonder on the Colorado River, that created Lake Mead and provides drinking and irrigation water for several states and part of Mexico. The Lake itself is lovely, and a popular spot for tourists – although it is so hot I can’t imagine relaxing at the water’s edge at all! The car was showing over 100 F on most of the journey. 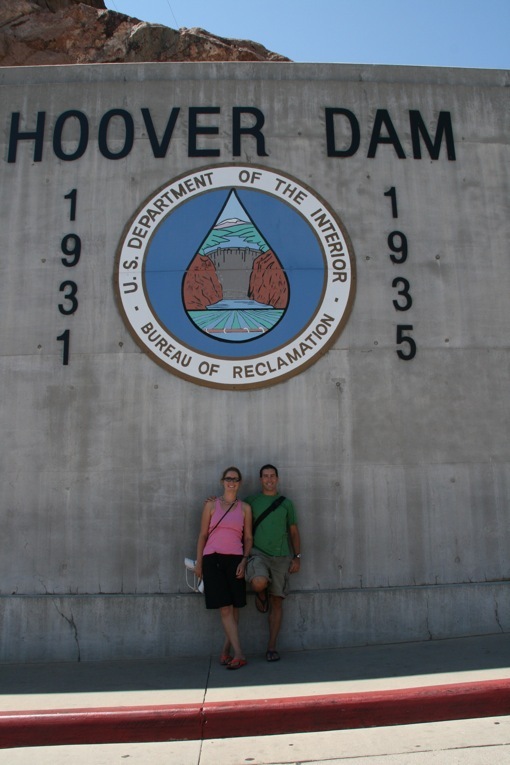 A few photos and we were off again, crossing into our 3rd State, Arizona, and heading towards the Grand Canyon. Our other stop en route was in Williams, a Route 66 town. 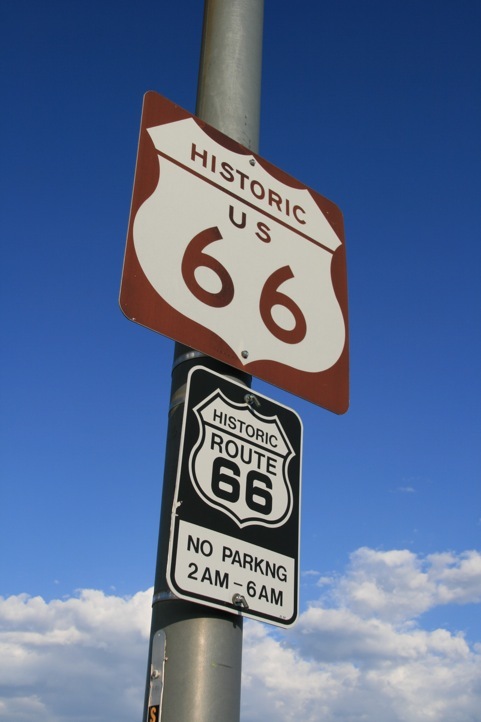 Route 66 was the first route to connect Chicago with LA. It was very important in its day, many famous people’s cars & trucks trundled along it. It has been superceded today by bigger Interstate highways, but many remain nostalgic for the 66. It is possible to mostly follow its route. It is popular with bikers – in fact we met three Irish lads on a 2 week route 66 trip on rented Harleys, with their adopted 4th, American John. Williams is a town surviving on this nostalgia, it markets itself towards the many tourists passing through on the way to the Grand Canyon. We stoppd at a souped up diner, replete with country singer who did a great rendition of Black is the Colour in honour of some other Irish guests! And so on to the Grand Canyon. We pitched out tent in the darkness in one of the park’s campsites that we had reserved (we arrived at about 10.30 – not unusual for us!) and admired the incredible stars. We got an early start to beat the intense heat that fills the Canyon, picking up fresh coffee & cinnamon buns for breakfast. Being good tourists we took the shuttle bus to our trailhead into the Canyon – silly idea as it delayed us by a good 45 mins – 45 minutes of increasing heat! 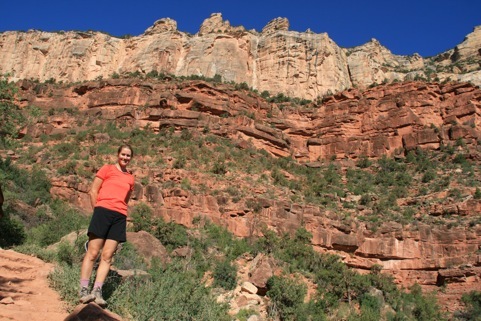 We desended at the Bright Angel trailhead for my first view of the incredible Canyon. Cathal was here 17 years ago with Fionan. 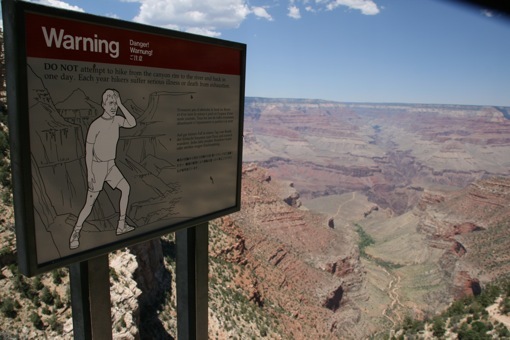 He recounted hiking to the bottom, camping illegally on a shed roof, and not sleeping that well after seeing the “Beware of the Rattlesnakes” sign! The backcountry permit system today would not allow for that, you could meet a “friendly but firm” ranger around any corner, and be fined stiffly if found without a permit. We hiked down as far as Indian Gardens. The lookout point (you can see it to the left of us in the photo) looked very attainable from the rim, but is in fact a good 6 hour hike away! We recovered from the very hot hike by relaxing in the El Tovar Hotel. We heard more Irish accents here than we have for months! Also I got carded at the bar – at the ripe age of 32! This happens regularly in the States, more to do with strict licencing laws than youthful good looks I think! 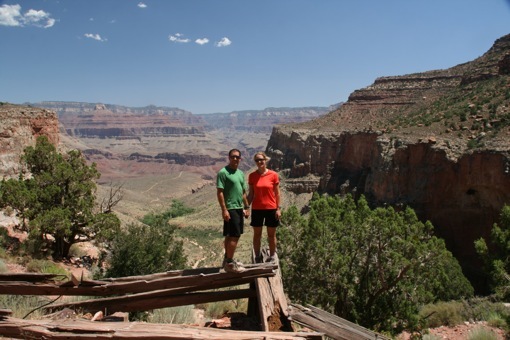 The best views of the park were to be had from the rim after all – the hike was great, but being in the canyon you couldn’t appreciate the whole thing. We spent the next morning visiting the various lookout points, which were very impressive. It is hard to get a handle on the size – the opposite rim is 10 miles away. 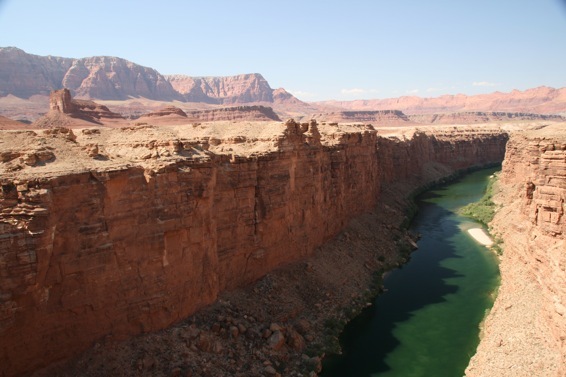 It is a mass of red rock, canyons, mesas and the Colorado River far below. 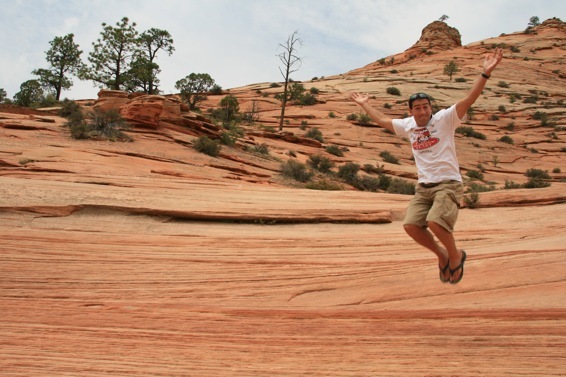 Cathal’s photo taking had to be reined in – there’s only so much red rock one memory card can take! 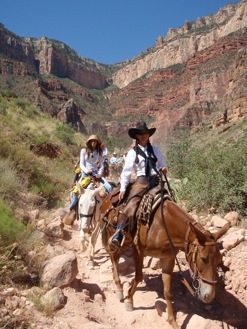 We left the Grand Canyon for Zion. Zion is the second (higher than the Grand Canyon) in a chain of 3 “canyons” formed by the great uplift of a huge land mass millions of years ago. The rivers sculpted the layers of rock (limestone, red sandstone and others) into the awe-inspiring formations that are there today. For the first time, the temperature did not go down at night….sleeping was not easy! I resorted to a dip in the river beside our tent to cool down before bedding down! It helped a bit. Zion may be less known than the Grand Canyon, but just as impressive. 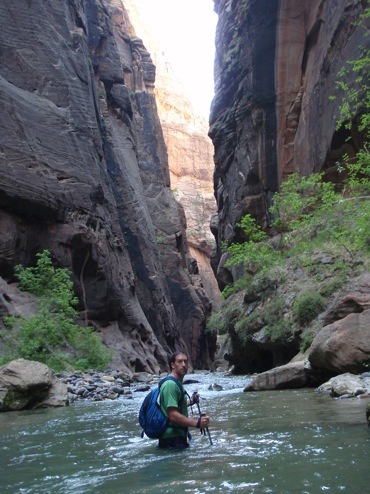 We took on the famous “Narrows”, a hike along a slot canyon up the Virgin River. We were walking IN the river about half the time, negotiating underwater stones and small rapids. It got narrower the further we got in – Cathal could touch both sides with his poles at one stage! 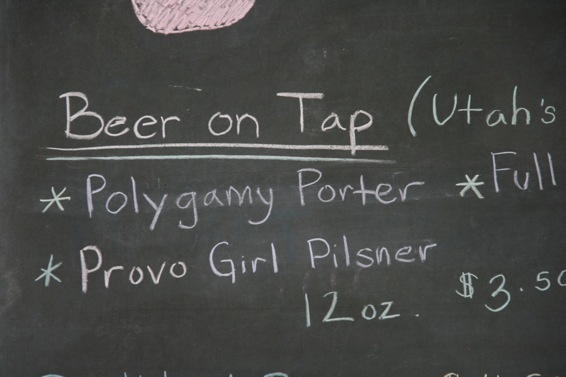 We discovered the strictness of the licencing laws of Utah in the “pub” – nowhere can serve beer or wine without food, and beer is usually 3.2%. The only way around this is to go to a “member’s club”. As one coffee shop’s slogan said, at least Coffee is still legal in Utah! 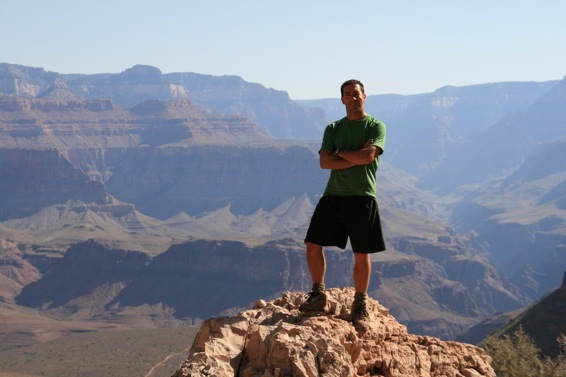 Cathal enjoyed it so much he planned the full day 12 hour thru-hike for the following day. However he slept through his alarm and missed the 6.30 shuttle….in the end it was no loss, as we hiked up the amazing Angels Landing peak instead, which involved a hairy ridge at the top. Worth it for the views. 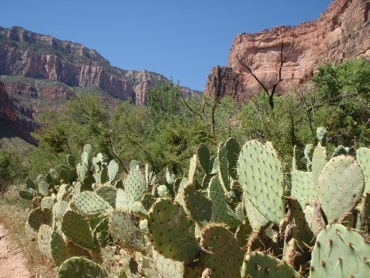 Zion was home to people over the centuries – the Anasazi, or Ancient Puebloans, moved southeast 800 years ago, driven out by drought and overuse. Soon after, Paiute peoples brought a lifeway fine-tuned to desert seasons and thrived. 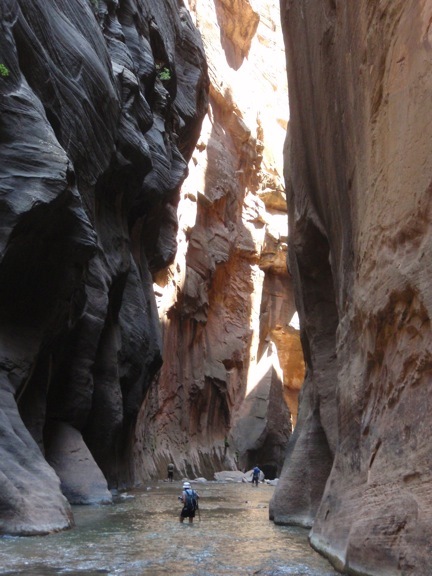 In the 1860s, just after settlement by Mormon pioneers, John Wesley Powell visited Zion on the first scientific exploration of southern Utah. By hard work and faith pioneers endured in a landscape that hardly warranted such persistence. Flash floods destroyed towns and drought burned the crops, and they were very isolated. 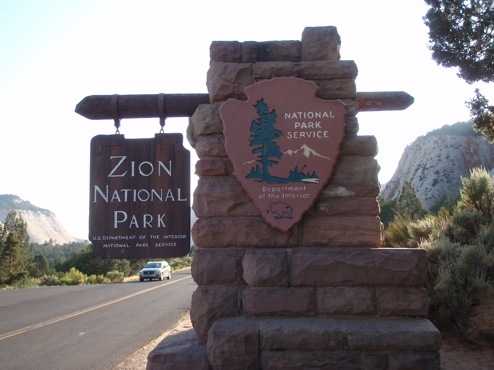 We left Zion on Sunday, heading for Bryce. 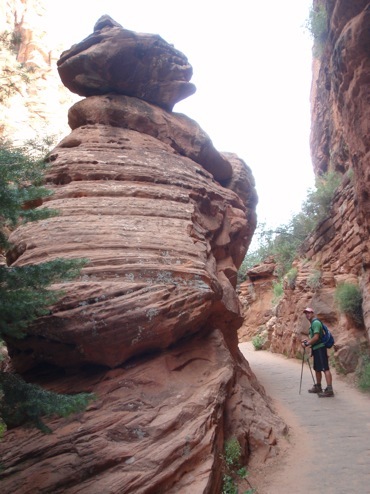 The road out of Zion to the east is full of geological formations such as slickrock – which got Cathal excited about mountainbiking! The drive took us through a few tiny towns, not even dots on the map. This is Mormon country, so it’s all country living and no carousing. We arrived into Bryce in the early evening, to much cooler temperatures and fewer crowds compared to the other two canyons. Bryce is totally unique. 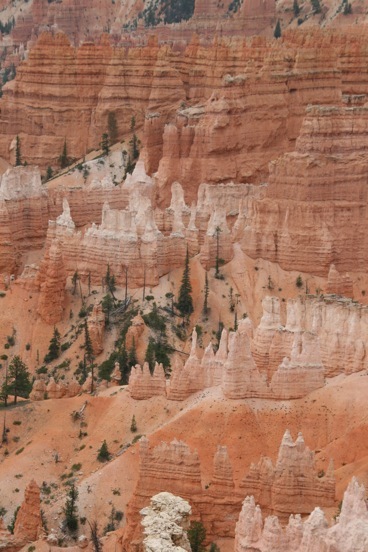 It is the highest of the three canyon parks, and is famous for its Hoodoos. 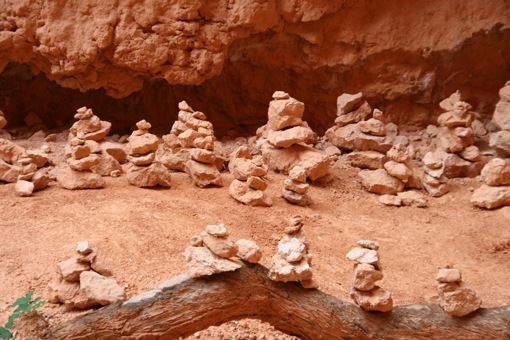 These are red rock formations, topped with limestone, that fill the canyon. It is a small area, but fascinating. 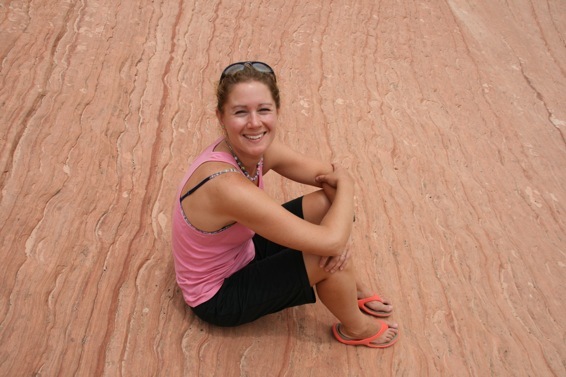 We took a hike among the columns, statues and arches, and returned via “Wall St”, a red rock canyon. The rock is so soft that the river is dyed brown/red from all the eroded material. We have met more European tourists on our Utah adventures than Americans, thanks to the strong Euro…may it last another couple of months at least! The visit to this park was not planned, but was recommended by a lady who raved about it. And it was totally worth the stop. It is another red rock, canyon and cliff area, but instead of being dry and dusty, it is interspersed with lush green valleys. The colour contrast is amazing. What makes Capitol Reef so special is that it is all just there on both sides of the road, you don’t have to park up, trudge with the crowds to a lookout point. 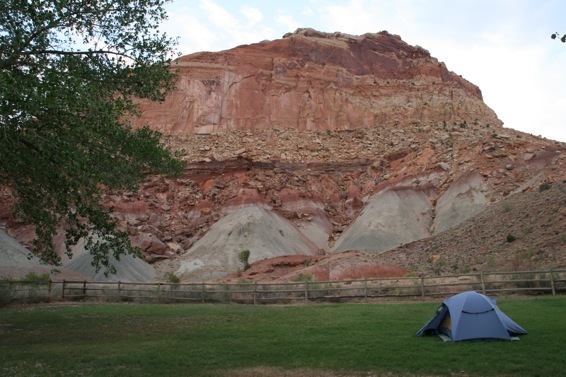 We camped at Fruita, a historic Mormon site where 8 families made their home. The last resident left in 1969. It is filled with about 2500 fruit trees, tended by the Mormons for years, and now looked after by the Parks. You can pick all the fruit you want (in theory – we didn’t find any!). Our camp spot was right below towering red cliffs, and deer fed on the grass right by us. We explored the museum of the Mormon homestead, did a bit of the scenic drive (more red rocks!) and bought some Mom’s Fruit Pie for later!